For as long as I can remember, Nutella was always a special snack. My family would usually have a jar on hand in our house, but it was typically saved for special occasions. As I got older and discovered that Nutella was served in many places around the world, and I was happy to have easier access to the delicious treat, rather than it being protected behind the cupboard and my mother’s watchful eye. However, after recently hearing assertions about the product that directly conflict with my values, I decided to research the sweet treat and its producer to uncover the facts about Nutella’s environmental impacts. First, let’s take a look at what Nutella’s ingredients. There are only seven ingredients in the hazelnut spread, and all of which are relatively well-known, which makes consumers feel confident they are making a completely natural and healthy choice by avoiding myriad artificial enhancers and sweeteners that often are found in snack foods today. Of course, the first ingredient of Nutella is sugar. Listed second is palm oil, followed by hazelnuts, cocoa, milk, lecithin (soy) and vanillin. The most controversial ingredient in that list is the palm oil. 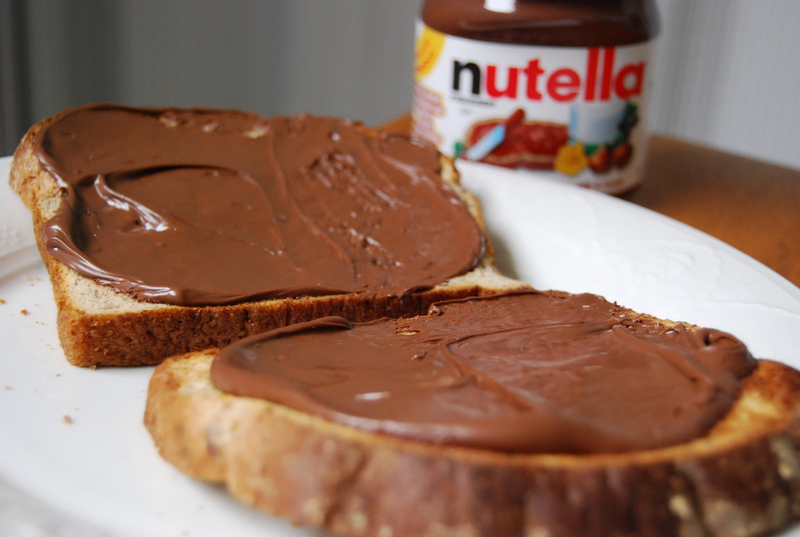 Since ingredients are listed on labels in order of quantity, as Nutella’s second ingredient, palm oil is a large component to the hazelnut spread’s recipe. Palm oil is extracted from the palm fruit, which grows on the African oil palm tree. It’s popular as a food ingredient due to its natural properties and versatility: It has a neutral odor and taste, is semi-solid at room temperature, and gives products a creamy, smooth texture. This is especially important for confectionary products like Nutella, because using palm oil avoids the use of the hydrogenation process, which creates unhealthy trans fats in products. Palm oil is also the most efficient oil, producing about 3.7 tons per hectare (or roughly 2.5 acres), whereas oil from soybeans, sunflowers, or rapeseeds produce much less. That 3.7 tons is equal to about 7,400 pounds – the equivalent weight of about two and a half Toyota Prius 4-door hatchbacks. All of this means that palm oil is frequently a hidden, yet substantial, component in modern consumers’ lives. According to Rainforest Action Network, palm oil is found in about half of packaged products in our grocery stores. It can be found in foods ranging from ice cream to instant noodles and from donuts to potato chips. Of course palm oil is not just used in food. It’s also found in multiple cosmetic products, such as lipstick and soaps. As a result of its popularity, worldwide demand for palm oil is skyrocketing. This demand is convincing farmers in tropical climates – most notably Indonesia and Malaysia, where about 85% of the world’s palm oil is cultivated – to cut down rainforests and create palm oil plantations instead. Not only does the destruction of rainforests release carbon dioxide emissions, but native peoples are being displaced for such plantations, and once functioning, these plantations are known to violate their workers’ human rights. To top it off, the biodiversity of these forests are being compromised, and orangutans and other species are becoming increasingly endangered from such vast deforestation. Ferrero Corporation produces Nutella along with a variety of other products such as Kinder treats, Tic Tacs, and Ferrero Rocher chocolates. The company has been widely criticized for using palm oil in products, which continues to fuel the demand for palm oil plantations. In 2015, France’s minister of the environment made a bold statement, declaring that consumers should stop eating Nutella if they want to help save the rainforest. The Ferrero Group responded by claiming it sources about 170,000 metric tons of palm oil annually, representing a mere 0.3 percent of the world’s 60 million metric tons of palm oil production (Casey). Due to such widespread criticism, Ferrero Group has been taking actions in many different ways to assure its customers the corporation is acting sustainably and responsibly. As a first step, in 2005, Ferrero Group joined Roundtable on Sustainable Palm Oil (RSPO). RSPO is a non-profit organization uniting seven stakeholders from the palm oil industry to ensure certified palm oil is environmentally and socially sustainable. In 2013, Ferrero Group stated that all Nutella products contain 100% segregated RSPO certified palm oil, and are traceable back to the plantation and production line (“Only Sustainable Traceable Certified Palm Oil for Ferrero”). Ferrero Group also launched its 10-point Palm Oil Charter in 2013, yet another commitment to consumers that the palm oil used in Nutella does not contribute to deforestation, species extinction, greenhouse gas emissions, or human rights violations. In order to implement the charter and to remain transparent about the process, Ferrero Group partnered with NGOs, one being The Forest Trust, which will monitor and publicly report the company’s performance every six months. In 2015, Ferrero Group became a member of the Palm Oil Innovation Group (POIG), which builds upon RSPO’s original commitments and standards. Ferrero Group is not only contributing to these polycentric efforts but the corporation is also becoming more transparent. Nutella’s website contains significant information regarding palm oil: What it is, how palm oil is harvested, environmental allegations against the company, and frequently asked questions about the crucial ingredient. The website also contains key numbers. Ferrero Group claims to have 99.5% traceability to the plantations and countries from which their palm oil comes. This number is more realistic than the 2013 claim of supposedly knowing where 100% of Ferrero Group’s palm oil is from. Additionally, the palm oil producing countries are listed: Peninsula Malaysia produces 75.87% of total volumes, Papua New Guinea produces 18.17%, Insular Malaysia produces 3.67%, Brazil produces 1.2%, Indonesia produces 0.91%, Guatemala produces 0.1%, and the Solomon Islands produce 0.08%. Finally, Ferrero Group also launched the “Fer-Way Project” in 2014, which supports the development of a corporate circular economy model. Ferrero Group is clearly working to make the company appear to be sustainable and environmentally and socially conscious at the very least. In fact, Greenpeace actually came to the company’s defense after the French minister of the environment called for consumers to boycott Nutella products. However, there is no easy answer in this situation. There are certainly improvements that could be made when it comes to the sustainability of the palm oil industry, which Ferrero Group seems to be leading. Roundtable groups may be hosted, but they are not the perfect solution. Groups like RSPO involve many different stakeholders and since all regulations must be passed via consensus, the actual standards for certification are set low in order to keep all stakeholders on board. But large corporations like Ferrero hold the power to change the status quo of palm oil. So, where does the consumer go from here? There’s no perfect solution or easy answer. But consumers hold a significant amount of power in today’s day in age. Completely avoiding palm oil is not only practically impossible but could also be considered unsustainable as so many people depend on the industry for an income. Perhaps a better response is to be aware of how many products palm oil is found in and attempt to minimize the use of such products, if possible. When purchasing products that contain palm oil, ensure the products is made by a company that is certified sustainable as a member of RSPO or another similar roundtable. Vote with your dollar to show corporations that sustainability is a not just a choice but mandatory. This does not mean you need to swear off Nutella, but perhaps minimize how often you do indulge in the sweet snack, only saving it for special occasions. Maybe Mom always knew best.